Worldwide marked its move from the Houston area (Montgomery) to the Dallas area (Arlington) this year by adding a day to its calendar. 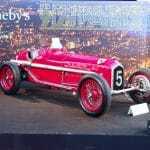 The Monical collection of no reserve cars filled the added day. It was a challenge for Worldwide which faced established competition in the market from Leake’s three-day sale in downtown Dallas at the Market Center on the same weekend. Worldwide conceded little on the weekend, with 78.4% of the vehicles offered changing hands for a total of $6,447,825, an average of $74,113 with a median transaction of $39,600. The confluence highlights the competition for venues and markets. 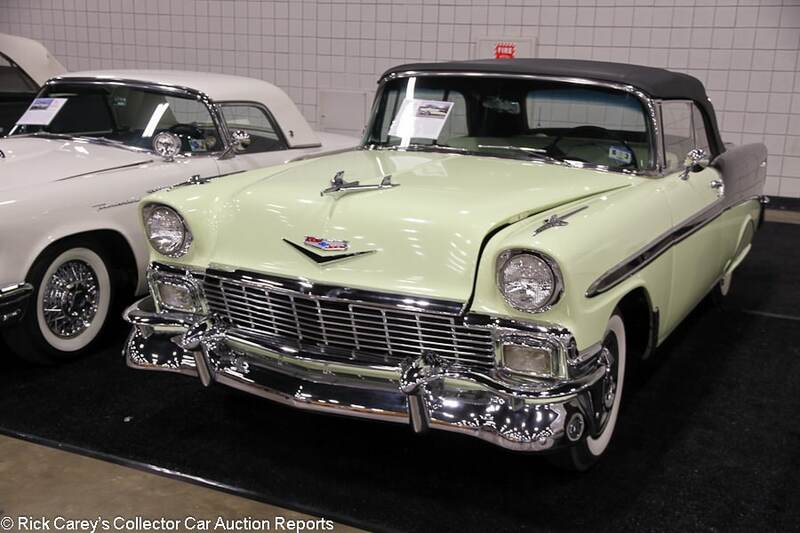 There are now four high profile Dallas area auctions each year: Leake twice a year, Worldwide in April and Mecum in September. Not so long ago there was only one. That a newcomer like Worldwide can close $6½ million in sales attests to the strength and resilience of the collector car market. It might also point to the resilience of the Texas energy industry which has weathered a severe storm in hydrocarbon prices and is showing a remarkable resurgence. Two auctions in close (by Texas standards) proximity on a single weekend is nothing if not a challenge. Andrew Newton dealt with the challenge in fine style, covering both in depth. The on-site observations and photos are his; Rick Carey is responsible for the final presentation and comments. Andrew missed on-site observations of one car, the Cobra Dragonsnake CSX2039, which isn’t a knock on Andrew. This car’s been around and around. It didn’t sell. Both qualifications made it a “walk-by” but its history is included in the report below for the record. 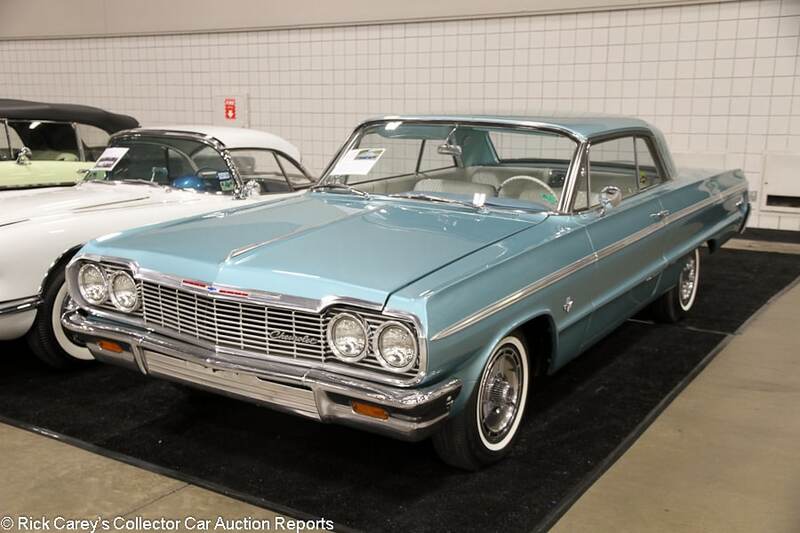 Lot # 1 1964 Chevrolet Impala SS 409 2-Dr. Hardtop; S/N 41447T241585; Aqua/White vinyl; Older restoration, 3- condition; No Reserve; Hammered Sold at $18,000 plus commission of 10.00%; Final Price $19,800 – 409/340hp, 4-speed, wheel covers, narrow whitewalls, dual mirrors, power brakes, bucket seats, floor shift, tach, pushbutton AM radio. – From the Monical collection. Lightly scratched up, possibly original chrome and brightwork. Sound paint other than light crazing and a few chips on the hood. Uneven trunk gaps. Light discoloration to the seats but otherwise very good interior. Older undercoated chassis. Big dent in the left rear fender. Finished in gorgeous colors and in ideal configuration, this SS 409 is better than your average driver but its flaws aren’t to be overlooked. – The compromised cosmetics of this older restored ’64 Impala SS 409 didn’t go unnoticed by the Worldwide bidders but in the end the new owner got a highly attractive drivetrain in a car that doesn’t need much, just a good new home where the appearance flaws can be overlooked in favor of the driving enjoyment. It is a good value at this price. Lot # 5 1956 Chevrolet Bel Air Convertible; S/N VC56N067947; Crocus Yellow, Onyx Black/Yellow vinyl with Black cloth inserts; Black vinyl top; Older restoration, 3 condition; No Reserve; Hammered Sold at $44,000 plus commission of 10.00%; Final Price $48,400 – 283 engine, 4-barrel, 3-speed with overdrive, wire wheel covers, whitewalls, fender skirts, hood ornament, dual mirrors, power brakes, column shift, pushbutton radio, dash clock. – From the Monical collection. 283 engine instead of the original 265. Lightly scratched older chrome. Upgraded dual circuit power brakes. Tidy older restored engine bay. Clean, straight vinyl top. Four large paint chips on the passenger’s side door. Several small scratches and chips on and around the trunk lid. Some of the brightwork is lightly pitted. Uneven door gaps. Very good, lightly worn interior. A straightforward, honest car restored a while ago that’s accumulated a few flaws over the years. Finished in unconventional but pretty colors. – This is a remarkable price for an older restored ’56 Bel Air convertible with a swapped engine even though the unusual overdrive will make it a desirable highway cruiser. The seller can be forgiven for exulting in the price it brought. 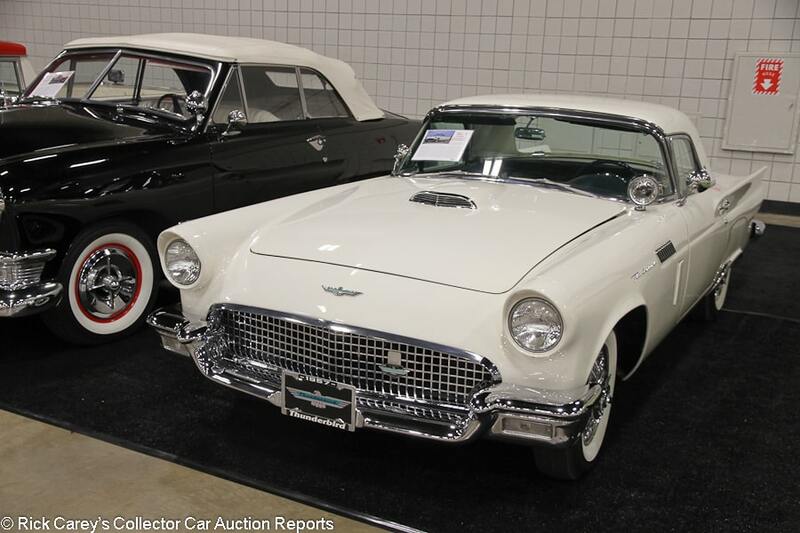 Lot # 7 1957 Ford Thunderbird Convertible; S/N D7FH161560; White/Black; Older restoration, 3 condition; No Reserve; Hammered Sold at $25,000 plus commission of 10.00%; Final Price $27,500 – 312/245hp, 3-speed, wire wheels, whitewalls, fender skirts, dual mirrors, cassette stereo, aftermarket air conditioning, heater. – From the Monical collection. Two scuffs on the right taillight bezel. Two small paint blisters on the nose. The rear window is completely missing on the hard top. It’s just gone. Sound older paint. Lightly scratched windshield frame. Very clean engine bay. Very good interior. Represented as a former ISCA show car, but certainly showing its age now. – Sold at Worldwide Houston in 2013 for $37,400, an appropriate price at the time. Even counting for the car’s age and flaws, this was a downright bargain with a no reserve sale flying under the radar in an auction with many more interesting specimens. Back in 1992 it was offered at Atlantic City with dual quads and a hardtop, both of which have now disappeared. 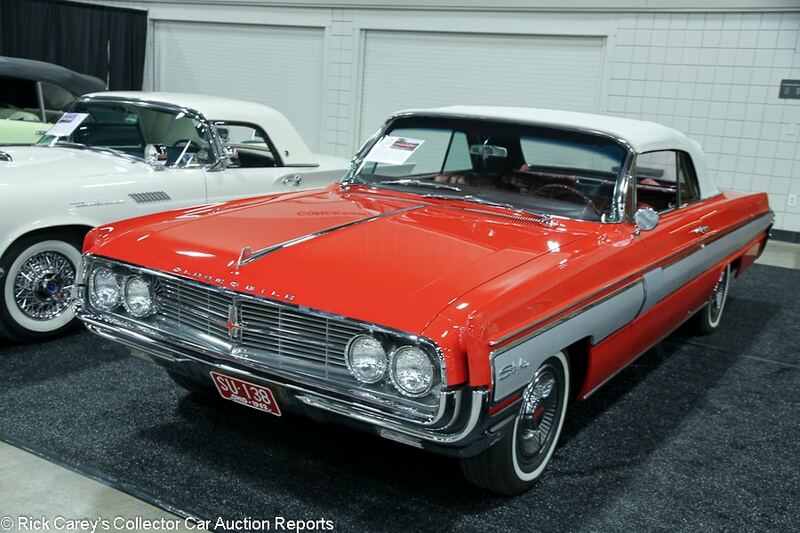 Lot # 8 1962 Oldsmobile Starfire Convertible; S/N 626M13999; Red, Silver/Burgundy vinyl; White vinyl top; Older restoration, 2- condition; No Reserve; Hammered Sold at $38,000 plus commission of 10.00%; Final Price $41,800 – 394/345hp, automatic, wheel covers, narrow whitewalls, console, floor shift, tachometer, dash clock, pushbutton radio, rear seat speaker, power windows. – From the Monical collection. Chip on the nose but otherwise really good older paint. A few small stains on the top. Very tidy underneath. Older tires. Excellent interior. This car has a ton of eyeball and looks just great in these colors. It wasn’t restored yesterday, but it doesn’t need anything. – The bidders appreciated its presentation and accorded it a superior price that may cause a little buyer’s remorse in the morning. Remorse will be supplanted by the enjoyment of owning and driving it, however, even if the investment will be hard to recoup. 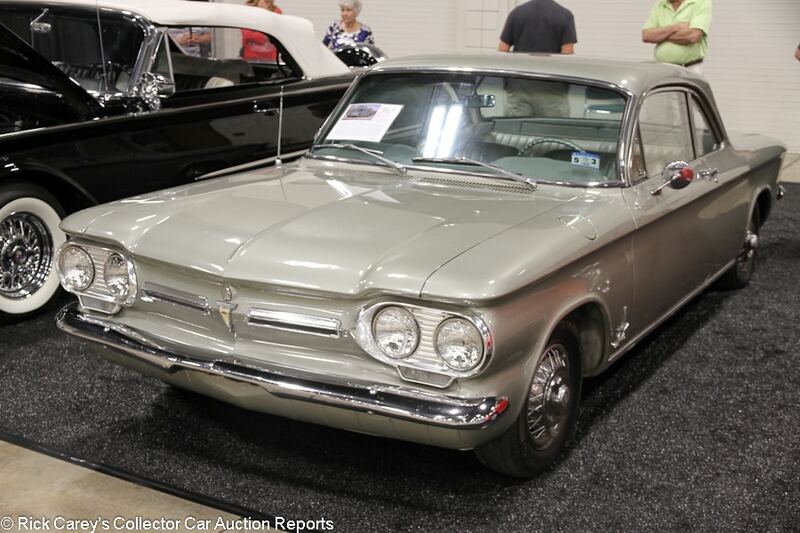 Lot # 9 1962 Chevrolet Corvair Monza Spyder 2-Dr. Sedan; S/N 209270160994; Metallic Green/Light Green vinyl; Cosmetic restoration, 3- condition; No Reserve; Hammered Sold at $6,000 plus commission of 10.00%; Final Price $6,600 – 145/160hp turbo, 4-speed, wire wheel covers, Michelin tires, dual mirrors, pushbutton AM radio, bucket seats. – A true Monza Spyder. Lightly scratched up bumpers and lightly pitted brightwork. Several chips on each door and the right rear fender. Some rot on each rear wheel well. Dull wheel covers. Cracking in the drip rails and around the windshield. Decent interior with newer upholstery, but there is lots of paint coming off the inside of the B-pillars and around the rear deck, and rust is poking through. Sound, unrestored engine bay. Represented as an older cosmetic restoration. Desirable equipment and attractive colors, but this car has not gotten the treatment it deserves. – It’s hard to say what to do with this car. Fully restored it wouldn’t even be worth 20 grand, so it’s hard to justify throwing much money at it. On the other hand, it’s too good to just serve as a donor car in a Corvair collection. Either way, the buyer snagged the car for a realistic price for its condition. 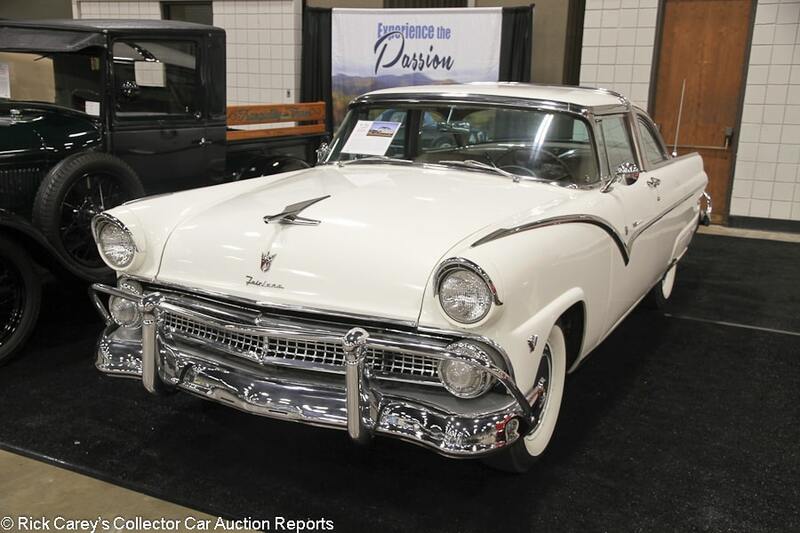 Lot # 11 1955 Ford Fairlane Crown Victoria 2-Dr. Hardtop; S/N U5DW232669; White/Tan vinyl with cloth inserts; Older restoration, 3+ condition; No Reserve; Hammered Sold at $21,000 plus commission of 10.00%; Final Price $23,100 – 272/162hp, automatic, wheel covers, whitewalls, fender skirts, Continental kit, column shift, pushbutton radio, dash clock, heater. – From the Monical collection. Somewhat dull but presentable older chrome. Good older paint other than a few chips on the tail and spare tire cover. Uneven door gaps. Light road wear underneath. Masking errors around the painted dash top. Good older interior with modern seat belts. Honestly advertised as a driver. That’s exactly what it is and there’s nothing wrong with that. – Especially at this price for a flashy Crown Vic in usable condition. It was bought for appropriate money. Lot # 14 1953 Ford F-100 Pickup; S/N F10D3D10734; Maroon, White grille/Red pattern cloth; Truck restoration, 3 condition; No Reserve; Hammered Sold at $14,000 plus commission of 10.00%; Final Price $15,400 – 215/101hp six, 3-speed, hub caps and trim rings, store brand tires, dual mirrors, wood bed, column shift. – From the Monical collection. Dull older paint and chrome. Chips around the windshield gasket, which fits unevenly. Lots of chips on the running boards. Tidy undercoated chassis. An older truck quality restoration that’s good enough for what it is, but done on a budget with cut corners. It’s nothing to write home about. 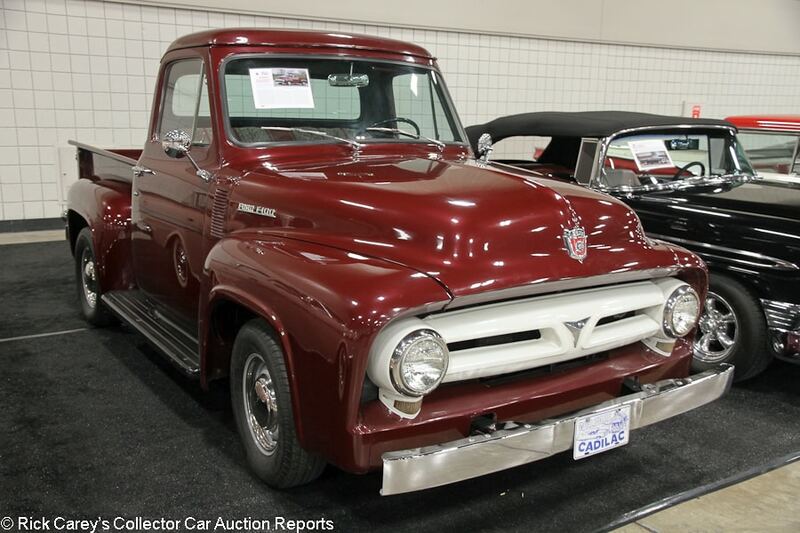 – This is an F-100 that is as much practical as it is a collector vehicle. It will haul parts, make dump runs and go to Lowe’s with steady reliability and little risk of serious damage from using its bed with reasonable care. With new trucks going off the lot well into five-figures it is a reasonable alternative for occasional use while making an unusual statement at modest cost. 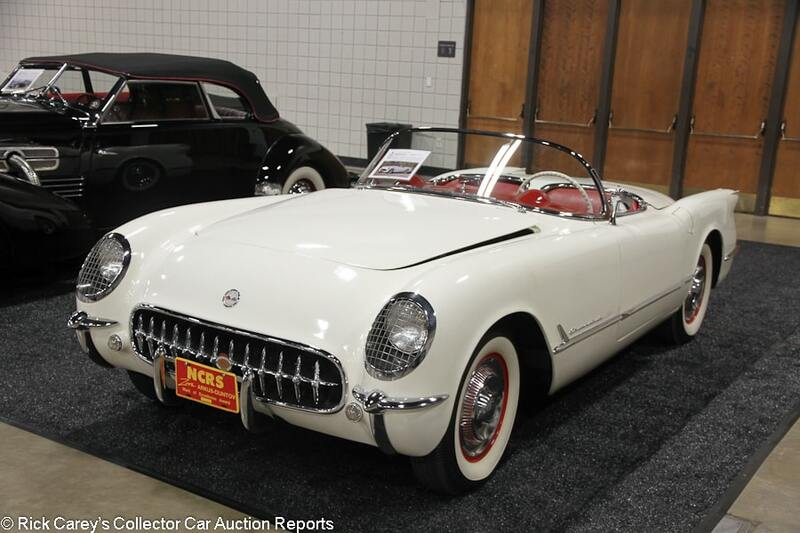 Lot # 16 1953 Chevrolet Corvette Roadster; S/N E53F001062; Polo White/Red vinyl; Older restoration, 2- condition; No Reserve; Hammered Sold at $210,000 plus commission of 10.00%; Final Price $231,000 – 235/150hp, Powerglide, spinner wheel covers, whitewalls, pushbutton radio. – From the Monical collection. Car 62 of 300 built. Lots of crazing in the paint. Some cracks and scratches on the tail. Factory gaps. Some popped seams in the driver’s seat, but otherwise very good interior. Tidy underneath. NCRS Duntov Mark of Excellence Award. NCRS Top Flight. Bloomington Gold. It was fully restored and has awards to show for it, but that was a long time ago. It could stand to be restored again. – Not sold at Worldwide Houston in 2010 at a $230,000 high bid and sold there in 2012 for $209,000. It’s not as good now as it was even five years ago, but brought a tick or two more money. A ’53 Corvette is the one to have even if substantially the same car built as a ’54 is a quarter the price. The pros and cons of this ’53 are reasonably reflected in this price. 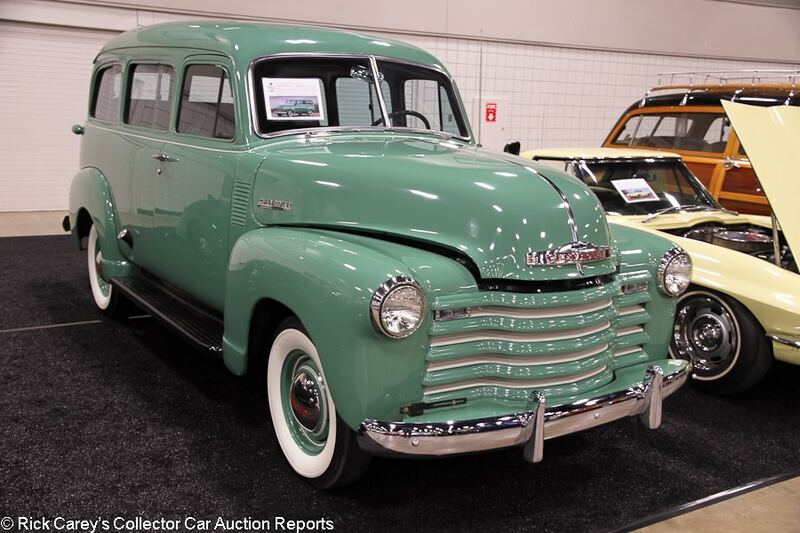 Lot # 18 1951 Chevrolet 3100 Suburban Carryall; S/N JBA569045; Pastel Green/Brown vinyl; Recent restoration, 2- condition; No Reserve; Hammered Sold at $40,000 plus commission of 10.00%; Final Price $44,000 – 217/92hp Stovebolt six, 3-speed, hub caps, whitewalls, three-row seating, aftermarket air conditioning, aftermarket radio, 12-volt electrics. – From the Monical collection. Restored but slightly dusty engine bay and underbody. Sound, attractive older paint other than some blisters on the left rear fender. Driver’s door doesn’t fit flush. Excellent fully restored interior. Restored over three years and done to considerably higher than average truck standards. – Sold by Worldwide at Houston in 2010 for $48,400 and bought here for appropriate money. While this much would buy a good FJ40 Land Cruiser this Suburban is much more rare and distinctive. 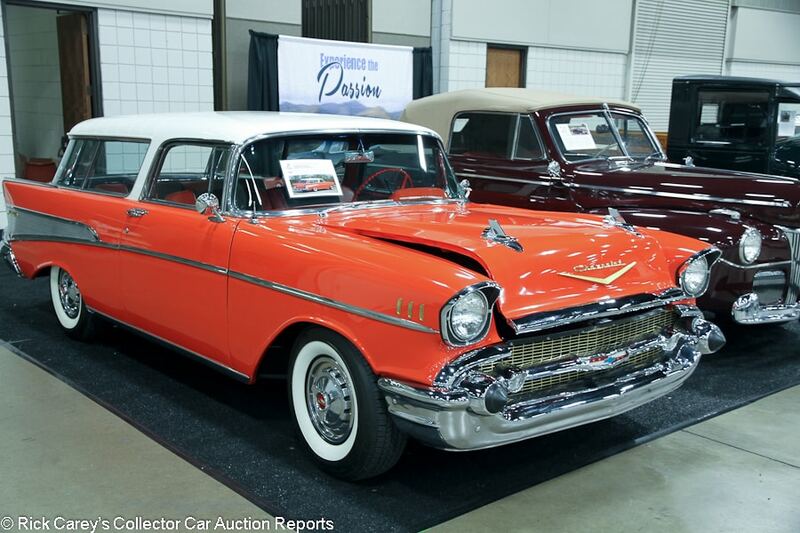 Lot # 21 1957 Chevrolet Bel Air Nomad 2-Dr. Station Wagon; S/N VC57J144378; Matador Red, India Ivory/Red vinyl with Black cloth inserts; Older restoration, 2- condition; No Reserve; Hammered Sold at $40,000 plus commission of 10.00%; Final Price $44,000 – 283/220hp, Powerglide, spinner wheel covers, whitewalls, dual mirrors, power steering, power brakes, modern cassette stereo, heater. – From the Monical collection. Tidy but used older restored engine bay. Erratic door fit. Pitted rear window frame. Touch up on the tail but otherwise sound older paint. Very good fully restored interior. Not represented as matching numbers. An older restoration that has held up remarkably well. – This car has had quite the auction history. It sold for $44,520 at Branson Fall in 2005, no-saled at Branson Fall in 2010 at $50,000, hammered not sold at a $45,000 high bid at the Classic Motorcar Auctions Glenmoor Gathering in 2011, hammered not sold again at a $47,000 high bid at Mecum Dallas in 2013, then sold for $44,000 at Worldwide Houston last year. Nomad values are about what they were back in 2010, and with five auction hits at almost exactly the same value, it’s safe to say this is what this car is worth. 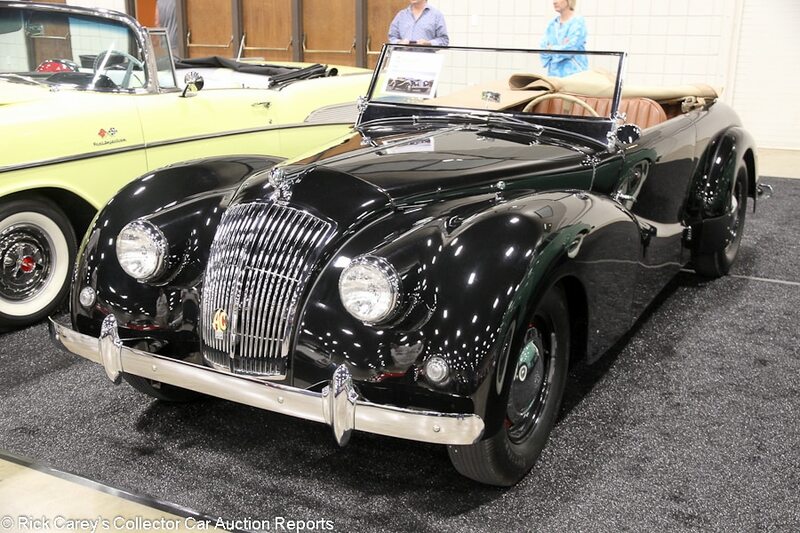 Lot # 24 1950 AC 2-Litre Bucklands Tourer; S/N ELX1512; Black/Light Brown leather; Older restoration, 2- condition; No Reserve; Hammered Sold at $65,000 plus commission of 10.00%; Final Price $71,500 – Lefthand drive. Hub caps, Firestone tires, folding windshield, banjo steering wheel, suicide doors, tan cloth tonneau cover. – From the Monical collection. Fairly dull older paint with several light scratches and chips. Rip and stains in the tonneau cover. Tidy restored chassis. Cracks in the steering wheel rim. Otherwise very good interior with lovely, supple, lightly worn leather. John Moir, Jr.’s car from new, albeit with a thirty-year gap in other hands. Restored in the late 80’s, but holding up well. – Sold at RM Hershey in 2014 for $82,500 from John Moir, Jr.’s collection, then sold at Worldwide Houston last year for $66,000. 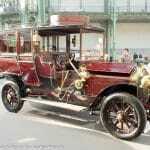 Only a few dozen Buckland Tourers were built, so it is difficult to stick a reliable value on such a rare car. With two similar results in the span of a year, though, it’s safe to call this a realistic price for a good if slightly aged example. 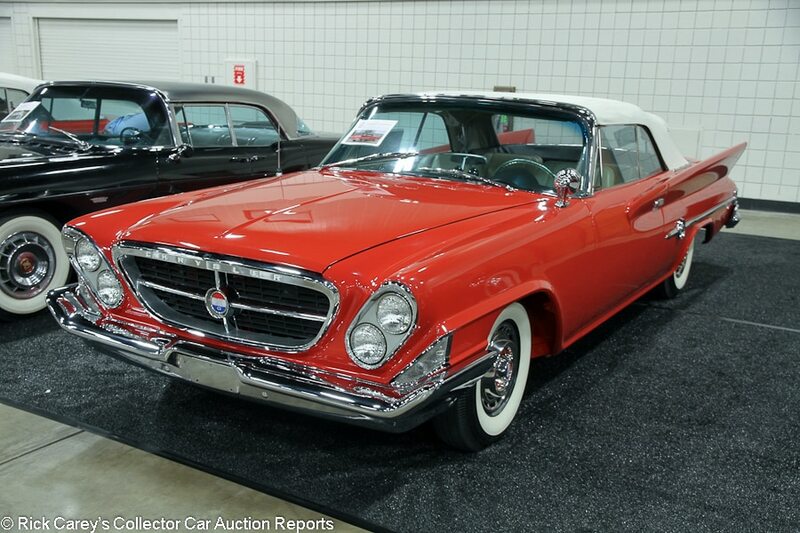 Lot # 27 1961 Chrysler 300G Convertible; S/N 8413110032; Mardi Gras Red/Beige leather; White vinyl top; Concours restoration, 1- condition; No Reserve; Hammered Sold at $135,000 plus commission of 10.00%; Final Price $148,500 – 413/375hp, automatic, wheel covers, whitewalls, bucket seats, console, tach, pushbutton automatic, pushbutton radio, power windows, factory air conditioning. – From the Monical collection. Very good paint and chrome aside from a chip in the front edge of the hood. Very good interior with lightly wrinkled seats. Clean top. Even gaps. Fully restored to like new standards during the 1990s and still looking great. A gorgeous Letter Car convertible. – Sold by Worldwide at Houston in 2006 in concours condition for $185,250, then seven years later for only $104,500. The restoration’s age is showing, but so is its quality. Its odometer has added only 185 miles since 2006; they must have been proud ones and a few more won’t hurt. 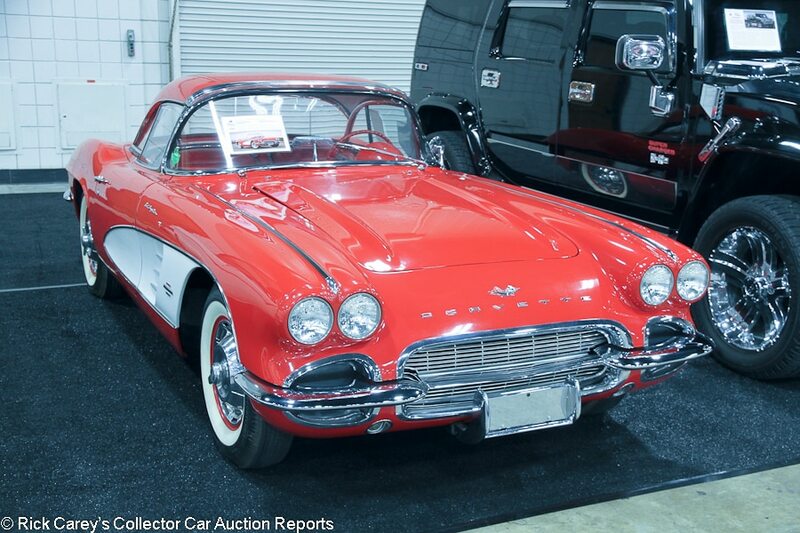 Lot # 34 1961 Chevrolet Corvette Convertible; S/N 10867S104509; Engine # 104509; Red, White coves/Red vinyl; Older restoration, 3+ condition; No Reserve; Hammered Sold at $63,000 plus commission of 10.00%; Final Price $69,300 – 283/315hp fuel injection, 4-speed, spinner wheel covers, whitewalls, hardtop, metallic brakes, Positraction, heater, WonderBar radio, aluminum radiator. – From the Monical collection. Tidy but used engine bay. Fairly worn underbody. Sound but slightly dull older paint with a chip above the left headlight and a blister above the fuel injection badge on the driver’s side. Two big scratches on the front of the hard top. Very good older restored interior. Represented as matching numbers and a four-owner car. Restored quite a few years ago and no show car, but an attractive driver Fuelie that will still turn heads. – Sold at Worldwide Houston in 2011 to Monical post-block at a reported $101,200, after hammering not sold at Kissimmee earlier that year at $85,000. He may have gotten six years of enjoyment out of this attractive Fuelie, but still can’t be easy to lose this much money on a car, a result that might have been mitigated by more attention to pre-auction preparation. The new owner made out like a bandit with this no-reserve sale. 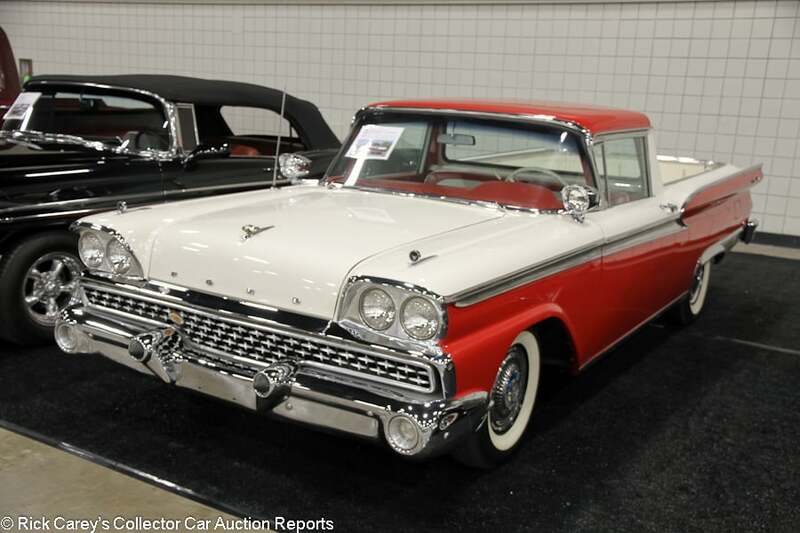 Lot # 35 1959 Ford Ranchero Custom Pickup; S/N H9RF196696; Red, White/Red, White vinyl with Black cloth inserts; Older restoration, 2 condition; No Reserve; Hammered Sold at $35,000 plus commission of 10.00%; Final Price $38,500 – 352/300hp, automatic, wheel covers, whitewalls, dual spotlights, column shift, air conditioning, Town & Country radio, power steering, power brakes, power windows. – From the Monical collection. Very good paint, chrome and interior. Some light wear to the cloth portions of the seat is the only significant sign of age. Very tidy underneath. Body-off restored about 20 years ago. AACA Senior in 2003. Remarkably well kept and still benefitting from high quality restoration work. – Sold by Worldwide at Auburn in 2011 for $57,750 when it was in like new condition, something that has changed very little in the subsequent six years. This is a desirably equipped Ranchero that brought less than expected, an excellent value to the new owner. 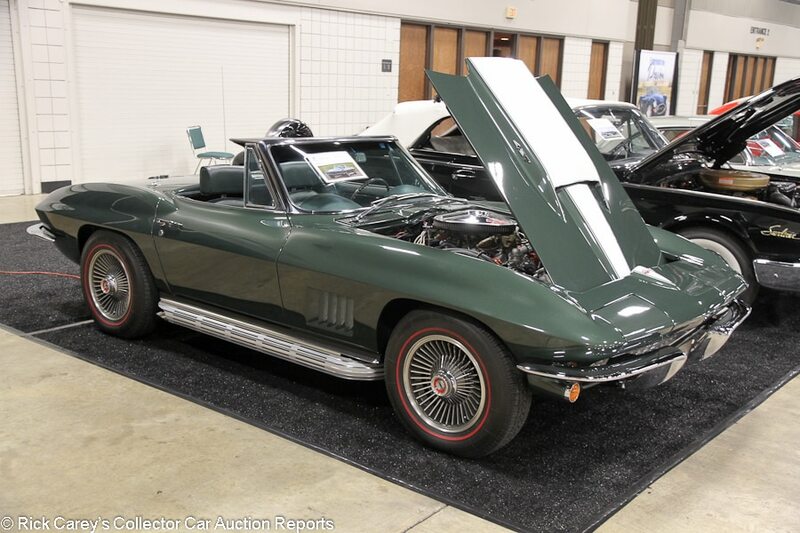 Lot # 36 1967 Chevrolet Corvette 427/435 Convertible; S/N 194677S104327; Engine # S104327; Goodwood Green, White stinger/Green leather; Older restoration, 2 condition; No Reserve; Hammered Sold at $94,000 plus commission of 10.00%; Final Price $103,400 – 427/435 L71 engine, 4-speed, power brakes, power steering, turbine wheels, newer aluminum radiator, Coker Classic red line tires, side exhaust, power windows, factory radio, dash clock. – From the Monical collection. Very tidy engine bay. Right headlight door is a bit loose. Very good paint. Excellent interior. Matching numbers. Highly desirable equipment, very pretty restoration and gorgeous colors. There’s not much more you can ask for, although there’s no mention of NCRS or Bloomington Gold, or if it was born with Tri-Power. – Sold by Worldwide in May 2008 for $85,800 when it was pretty nasty and neglected. It’s much better now although the documentation shortcomings remain and are still a significant handicap on its value. At this price the buyer traded condition and equipment for documentary certainty, a reasonable compromise. 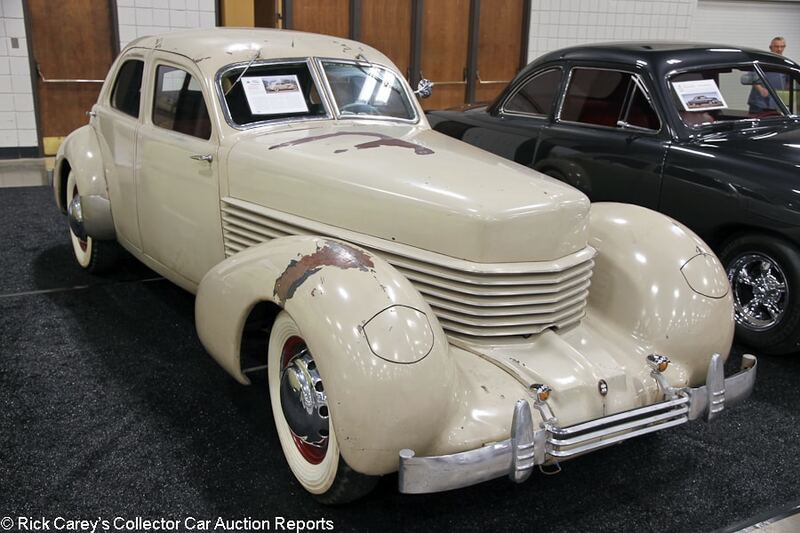 Lot # 39 1936 Cord 810 4-Dr. Sedan Westchester; S/N 8101794A; Beige/Burgundy cloth piped in White; Visually maintained, largely original, 4+ condition; No Reserve; Hammered Sold at $30,000 plus commission of 10.00%; Final Price $33,000 – Wheel covers, Goodyear wide whitewalls, suicide front doors, Bendix pre-selector gearbox. – From the Monical collection. Repainted beige decades ago on top of the original maroon. Paint is coming up all over the place. Cracks around the windshield wipers, which are a bit rusty. Dry, cracked weather stripping. Tires are relatively new. Oxidized chassis but no major rot. Sound interior. Acquired from the estate of Glenn Pray. In essentially barn find condition, although it reportedly runs and drives. – A good, sound, presentable Cord 810/812 Beverly is a $60,000 car and this one is a long way from meeting that description, a gap too far to bridge with the intervening value. It’ll have to be a labor of love, but for these cars with their distinctive Gordon Buehrig design that’s not a lot to ask: they are seductive visions. A troublesome project or a dream come true at an affordable price? Let’s call it a dream come true and hope for the best. 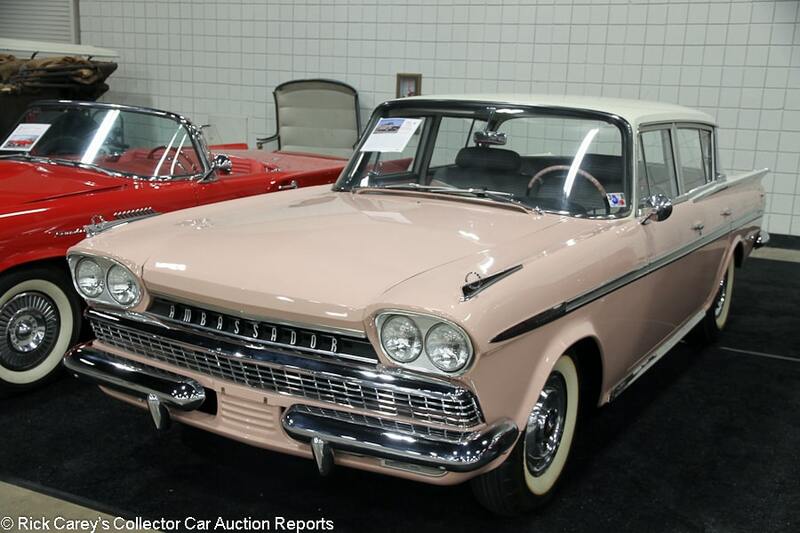 Lot # 42 1960 Rambler Ambassador Custom 4-Dr. Sedan; S/N H100777; Pink, White/Pink, White vinyl with Gray cloth inserts; Older restoration, 3+ condition; No Reserve; Hammered Sold at $17,000 plus commission of 10.00%; Final Price $18,700 – 327/270hp V8, 3-speed, wheel covers, whitewalls, column shift, pushbutton radio, dash clock. – From the Monical collection. Slightly erratic door fit. Uneven trunk gaps. Discolored whitewalls. Sound, attractive older paint and chrome. Brightwork is a little dull. Good, lightly worn interior. Formerly part of the Sterling McCall Old Car Museum. Supposedly built at the old factory by enthusiasts out of leftover parts. Restored years ago but lightly used since. You rarely see these at all, so to see one in such good shape is a bit of a treat. – Someone had to love Rambler Ambassadors a whole heck of a lot to go to the time and effort to find leftover parts and then assemble them into a … what? A continuation, and then give it a chassis number. The bidders in Dallas appreciated it, whatever it is, and paid long money for an otherwise mundane Rambler. 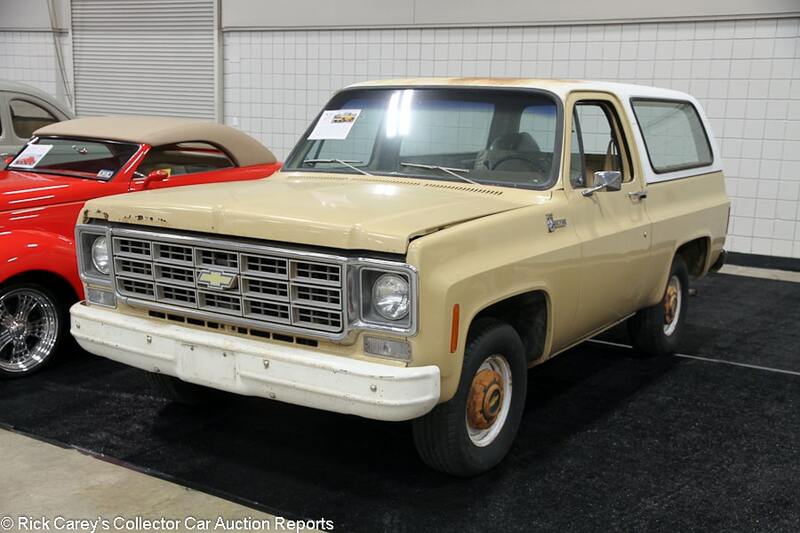 Lot # 43 1977 Chevrolet K5 Blazer Open Top Utility 4×4; S/N CCU187F141972; Tan, White top/Tan vinyl with cloth inserts; Unrestored original, 4 condition; No Reserve; Hammered Sold at $3,250 plus commission of 10.00%; Final Price $3,575 – 350/165hp, automatic, hub caps, Michelin tires, RWD, bucket seats, air conditioning, Sony cassette stereo, power steering, power brakes. – From the Monical collection. Rust holes in the nose. Lots of pitting on the bumpers. Sun-baked, rusty roof. Pitted, rusty wheels and exhaust. Sizable dent in the door. Oxidized hub caps. Long, deep scratch on the rear passenger’s side of the body. Small rip in the driver’s seat and light discoloration on the upholstery, but mostly good original interior. Frame is oxidized, but none of the rust looks terminal. Relatively rare short wheelbase, RWD model. Given the configuration, the color and the condition, it looks like it might have been a municipal vehicle. Rode hard and put up wet, but not quite too bad to consider buying. 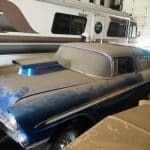 – Sometimes, auction bidders see a rough, dirty original vehicle and picture buried treasure, the thrill of embarking on a rewarding restoration project or the opportunity to own a piece of history. In this case, the Dallas bidders just saw this Blazer for what it is. It’s a rusty old truck, and they showed what they thought of it with their bids. By any reasonable assessment this is a parts truck. 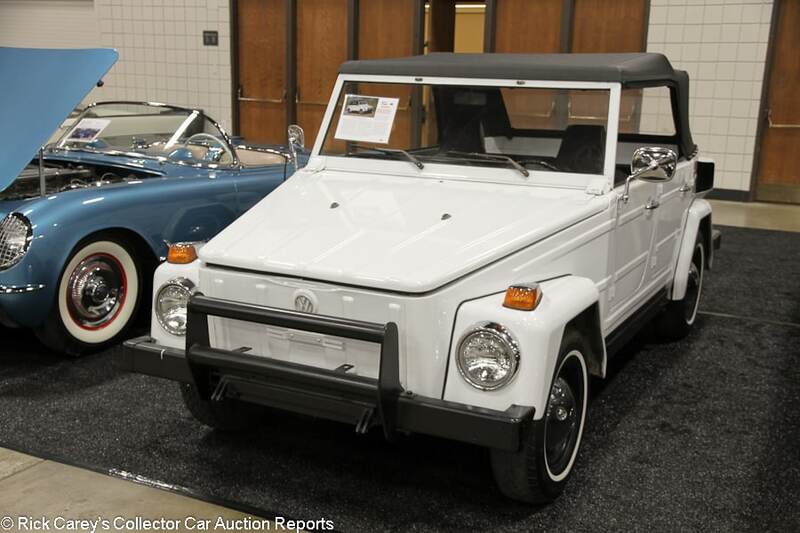 Lot # 44 1973 Volkswagen 181 Thing Convertible; S/N 1833022899; White/Black vinyl; Black vinyl top; Enthusiast restoration, 3 condition; No Reserve; Hammered Sold at $15,000 plus commission of 10.00%; Final Price $16,500 – Hub caps, narrow whitewalls. – From the Monical collection. Decent older respray with some oxidation around the hinges as well as several chips and a large crack near the right front fender. Fuel has spilled below the filler neck and roughed up the paint. A few small dents in the hood. Very good replacement top. Decent upholstery, but the rest of the interior is pretty rough. Road wear underneath. Slightly grimy but presentable engine bay. Given enough attention to keep it presentable but nothing special. – White is an odd color for a look-at-me beach cruiser like a VW Thing, which you usually see painted something like orange or yellow. In any event, this was a no better than decent example and it brought a healthy price. It had been sold by Worldwide at Houston in 2011 for $9,900 and it wouldn’t have been anything more than a sound buy at that price today. 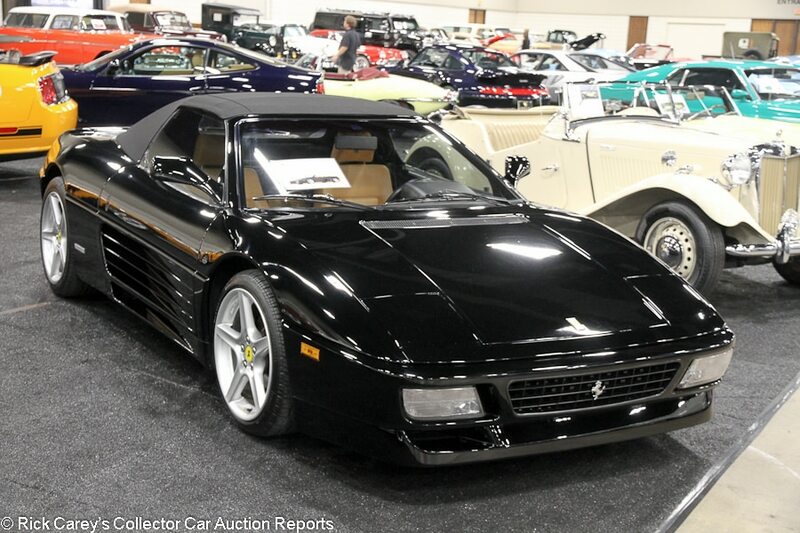 Lot # 110 1995 Ferrari 348 GTS Spider, Body by Pininfarina; S/N ZFFRG43A6S0098938; Black/Tan leather; Black cloth top; Estimate $75,000 – $90,000; Unrestored original, 2- condition; With Reserve; Not sold at Hammer bid of $57,000 – Speedline wheels, Pirelli tires, tinted glass, power windows, air conditioning. – Windshield is delaminating in several spots at the bottom. Several small chips on the nose and headlight doors. Repainted front bumper. Clean top. Very good, like new interior. Recent belt service. A used 348 showing 18,082 miles. – While not generous, the reported high bid was fair in this case for a used 348, which remains one of the cheaper ways to get into Ferrari ownership and offers both modern technology and amenities balanced by the regular maintenance requirements of its Gilmer belt camshaft drive. 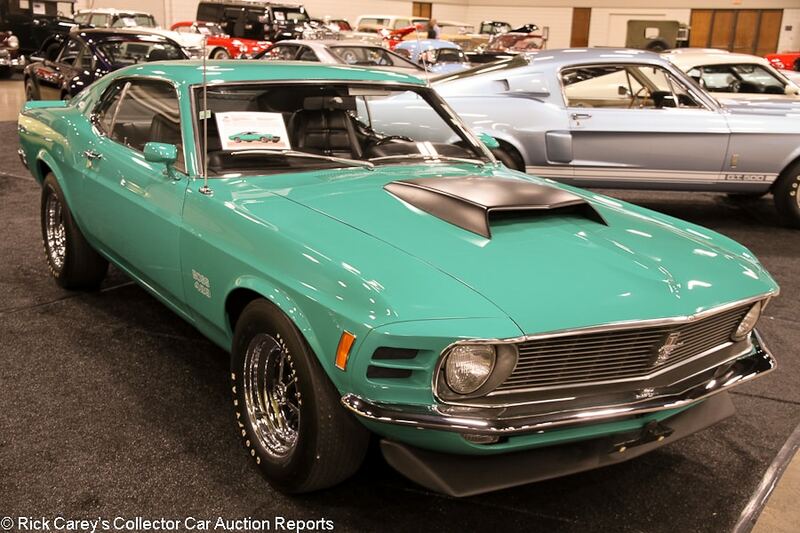 Lot # 115 1970 Ford Mustang Boss 429 SportsRoof; S/N 0F02Z126291; Grabber Green, Black hood scoop/Black vinyl; Estimate $275,000 – $325,000; Older restoration, 2- condition; With Reserve; Not sold at Hammer bid of $210,000 – 429/375hp, 4-speed, Polyglas GT tires, front spoiler, dual mirrors, console, Hurst T-handle shifter, Philco pushbutton radio, dash clock, Marti Report. – Headlight surrounds, rear bumper and trunk lid are not the same shade as the rest of the car. Good paint otherwise. Doors don’t fit flush. Newer dash, but the rest of the interior looks original and sound. Windshield frame doesn’t fit quite evenly. Very tidy and restored underneath. Restored about 14 years ago to what are described as concours standards, though that’s a bit of an exaggeration. – The condition of this Boss Nine didn’t square up with its description and that made the reported high bid sufficient to have bought it. 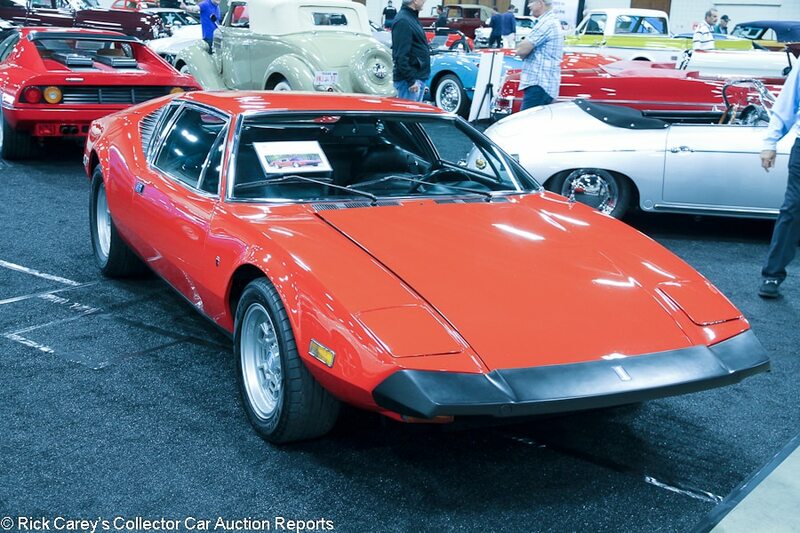 Lot # 117 1974 De Tomaso Pantera L Coupe, Body by Ghia; S/N THPNPU07338; Red/Black vinyl; Estimate $120,000 – $140,000; Visually maintained, largely original, 2- condition; With Reserve; Hammered Sold at $82,000 plus commission of 10.00%; Final Price $90,200 – 352/266hp, 5-speed, Campagnolo wheels, Ansa exhaust, power windows. – Numerous small chips and light scratches on the hood and nose. Long, deep scratch right behind the driver’s door. Otherwise good, shiny and presentable mostly original paint. Very good, mostly original interior with what looks like newer upholstery. Original but remarkably clean underneath. Showing 11,537 miles. Very late U.S. market car. A low mileage later Pantera that’s gotten cosmetics when necessary but hasn’t really needed major attention. It’s a great driver. – Sold for $115,500 at Mecum Kissimmee in 2016, then not sold at Mecum Monterey a few months later at a $110,000 high bid. Original, unmolested Panteras are quite collectible, but the later Pantera L’s like this with detuned engines and rubber bumpers aren’t as desirable. The seller had more realistic expectations here than in Monterey, letting it go for a perfectly reasonable price that still accounts for its impressive level of preservation. 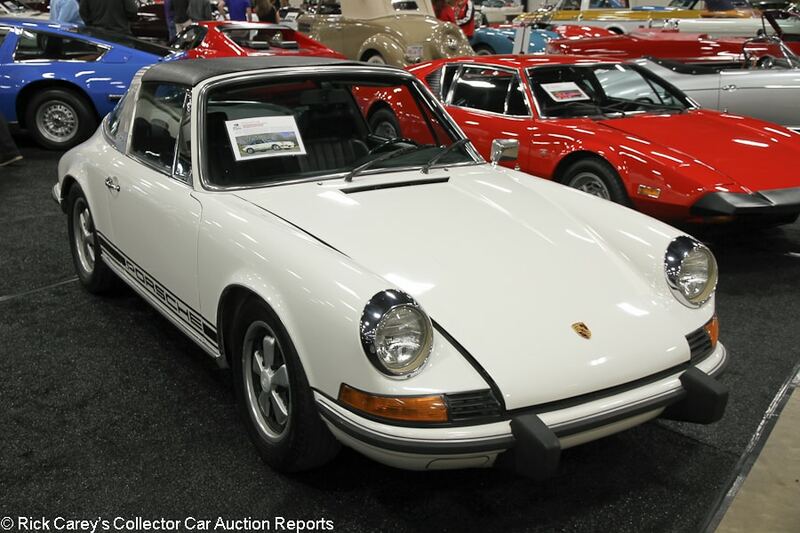 Lot # 118 1973 Porsche 911T Targa; S/N 9113110557; Light Ivory, Black vinyl roof/Black leatherette; Estimate $80,000 – $110,000; Visually maintained, largely original, 3 condition; With Reserve; Not sold at Hammer bid of $57,000 – 2341/140hp, 5-speed, Fuchs wheels, dual Webers, store brand tires, radio delete, tinted glass. – Sound, average quality older paint with a few chips on the left front fender. Lightly scratched window frames and headlight bezels. Lightly scratched wheels. Wavy roof panel vinyl. Sound, dry underbody. Faded original gauges. Wavy dash top. Represented as numbers matching with rebuilt original engine. Porsche CoA. A sound, mostly original but driver quality California car that has spent at least some time outside. Last year for the 2.4-liter engine and before impact bumpers on the 911. – Sold at Worldwide Auburn in 2016 for $68,750. 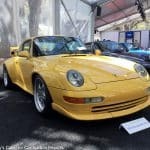 Perhaps the buyer last year expected 911 prices to keep climbing but they haven’t, and that price was as much overpaying then as it is unreasonable to expect it today. The reported high bid was perfectly appropriate, even generous in today’s environment. The seller was underwater from the beginning and it will be a long while until, if ever, the tide turns. 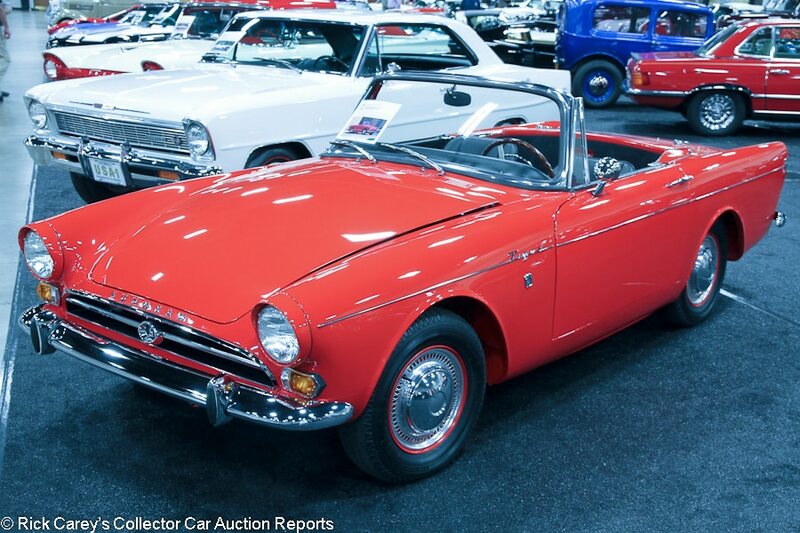 Lot # 121 1965 Sunbeam Tiger Mk IA Convertible; S/N B9473518LRXFE; Carnival Red/Black; Estimate $100,000 – $125,000; Recent restoration, 2 condition; With Reserve; Hammered Sold at $105,000 plus commission of 10.00%; Final Price $115,500 – 260/164hp, 4-speed, wheel covers, woodrim steering wheel. – Nearly spotless engine bay. Very good paint, chrome and interior. Represented as matching numbers. A 2014 restoration, it’s still fresh and gorgeous. – Sold at Mecum Kissimmee in 2015 for a strong $101,520, then sold at Mecum Monterey last year for $77,000 and hammered not sold a few months later at Mecum Dallas at a $75,000 high bid. Jumping off the Mecum train worked out well for the seller in this case, with the Worldwide bidders willing to offer into six figures for the top notch Tiger that this car is, a price that swims upstream against recent 260 Tiger results. 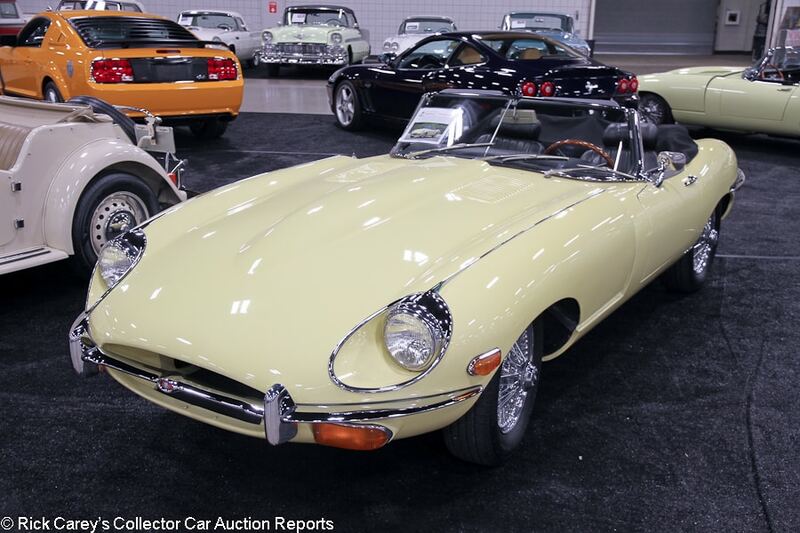 Lot # 123 1969 Jaguar XKE SII Roadster; S/N 1R7694; Primrose/Black vinyl; Black top; Estimate $100,000 – $120,000; Older restoration, 3+ condition; With Reserve; Not sold at Hammer bid of $72,000 – Centerlock wire wheels, Cooper tires, black cloth boot cover, woodrim steering wheel, BMC radio. – Good chrome. Decent paint, but the filler cap and trunk lid aren’t the same shade as the rest of the car. Doors don’t fit flush. Very tidy underneath. Good, lightly worn interior with original gauges and switchgear. A straightforward older restoration that’s good enough for a Series II but nothing to write home about. 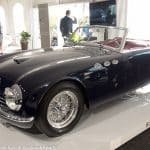 – This car has a long history of no-sales: at Mecum Monterey in 2015 at a $61,000 high bid, at Motostalgia Amelia Island last year at a $76,000 high bid, at Auctions America Ft. Lauderdale last April with a bid of $65,000, and at Hilton Head in November where the bid was only $51,000. The car has gotten some cosmetic work, but not enough to justify holding out at this generous reported high bid. The seller isn’t looking around at other results. 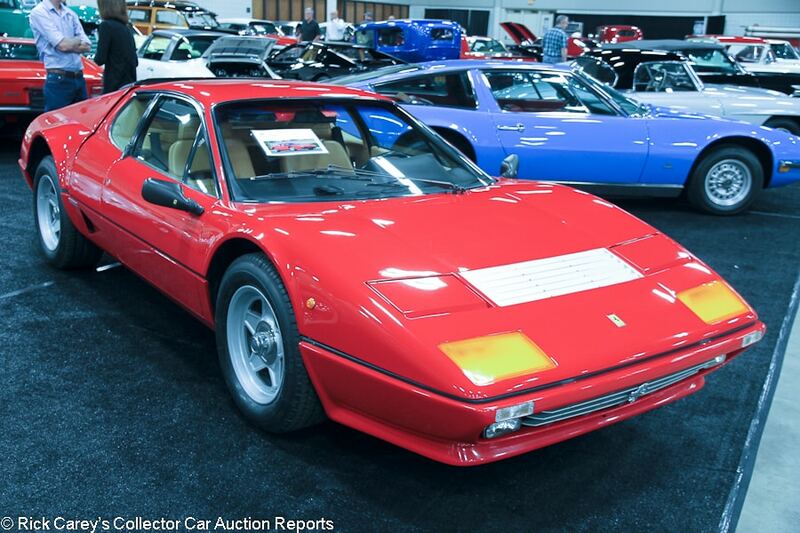 Lot # 126 1983 Ferrari 512 BBi Coupe, Body by Pininfarina; S/N ZFFJA09B000047411; Rosso Corsa/Tan leather; Estimate $225,000 – $275,000; Unrestored original, 2- condition; With Reserve; Hammered Sold at $215,000 plus commission of 10.00%; Final Price $236,500 – Michelin TRX tires, Pioneer cassette stereo, power windows, air conditioning, leather-wrapped Momo steering wheel. – Long scratch on the hood. A few small chips on the nose and bottom lip. Otherwise very good original paint. Very good interior. Reportedly only one owner from new and originally delivered in the U.S. Properly federalized and documented, which is important to consider when Boxer shopping. – This is an appropriate for a 512 BBi. It wasn’t so long ago that 512 BBis were five-figure cars, then they took off. Now they’re settled back to values like this, a reasonable compromise for a Flat Twelve Ferrari supercar even if there’s only 340hp between the driver and the rear axle. In 1983 340hp was spectacular. 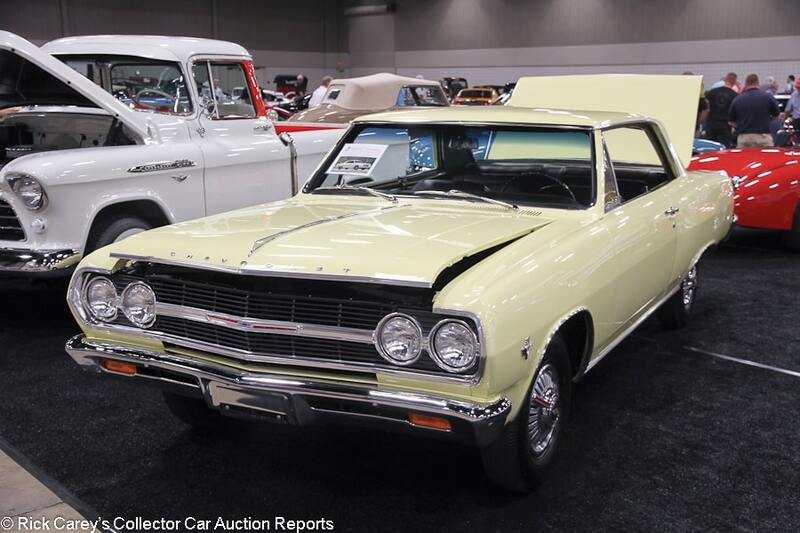 Lot # 128 1965 Chevrolet Chevelle Malibu SS 2-Dr. Hardtop; S/N 138375A142596; Crocus Yellow/Black vinyl; Estimate $100,000 – $120,000; Recent restoration, 2- condition; With Reserve; Not sold at Hammer bid of $73,000 – 327/350hp L79 engine, 4-speed, wheel covers, Silvertown blackwalls, floor shifter, factory radio, dash clock, Protect-o-Plate documented. – Some oxidation and pitting on the console trim and dash. Otherwise very good interior. Beautiful, highly detailed engine bay with chromed air cleaner. Rocker trim doesn’t quite fit flush. Very good paint. Nearly spotless underneath. Fully restored a few years ago. Mostly very good and finished in attractive colors, but a few corners were cut. – Hammered not sold at Mecum Indy in 2015 for $47,000, then sold for an expensive $71,500 at Mecum Indy a year later. 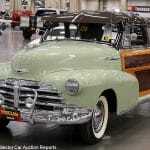 It then went to Mecum Dallas in November of last year where it was bid to $80,000 but inexplicably didn’t sell. This makes for two very generous offers on this attractive but not exceptional car which has traveled on and off transporters since Indy last year adding only 6 more miles to its odometer. Worldwide’s presale estimate was very ambitious, and so are the consignor’s expectations. 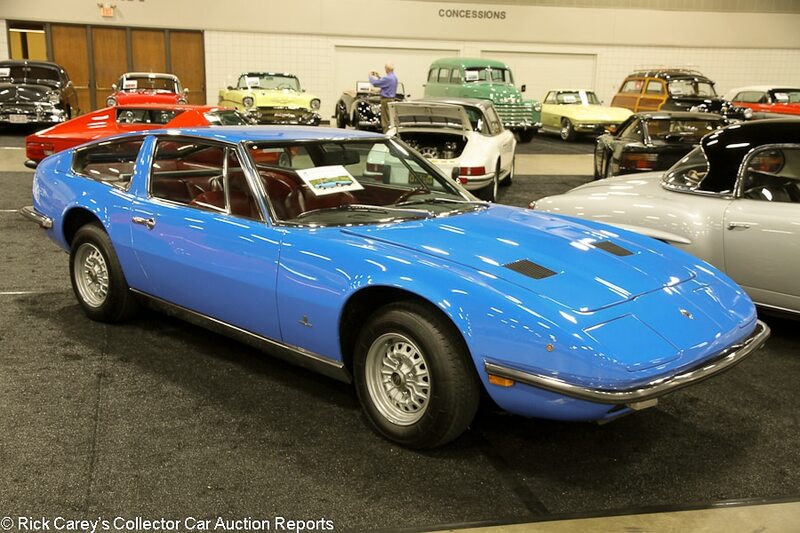 Lot # 130 1972 Maserati Indy 4.7 Coupe, Body by Vignale; S/N AM116471228; Light Blue/Red leather; Estimate $80,000 – $100,000; Cosmetic restoration, 3 condition; With Reserve; Not sold at Hammer bid of $67,500 – 4719/290hp V8, 5-speed, alloy wheels, Vredestein tires, woodrim steering wheel, wood shift knob, JVC cassette stereo, power windows, air conditioning. – Originally finished in maroon over white. Somewhat dirty unrestored engine bay. Scratched up Maserati badge. Rub strips on the bumpers are wavy. Old repaint in essentially Ford Grabber Blue with cracks behind the passenger’s door and some chips on the nose. Very dull and scratched up rear bumper. Some rust repair on the passenger’s side floor pan. Mostly very good original interior other than old replacement upholstery. Presentable and inherently interesting, but it hasn’t been babied and doesn’t have complete originality as an excuse for its somewhat tired appearance. – This is a realistic bid for this Indy with its many flaws and suggestions of deferred attention. It should have been taken with gratitude. 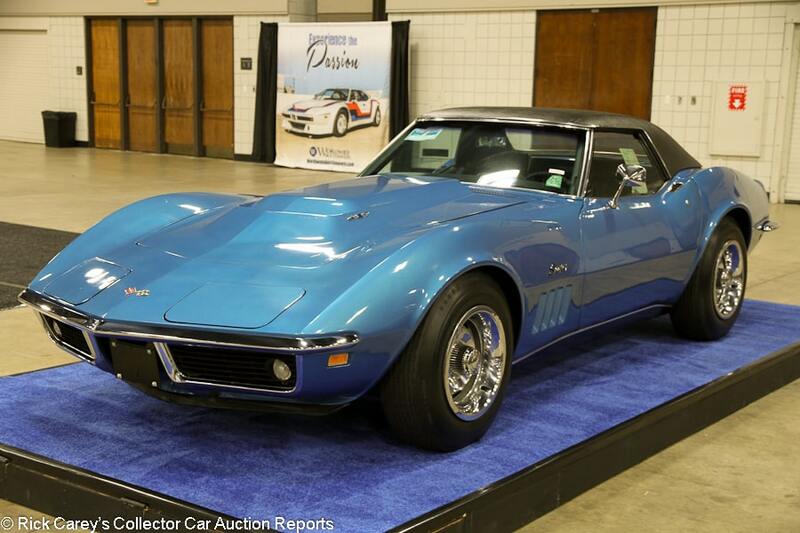 Lot # 132 1969 Chevrolet Corvette L88 Convertible; S/N 194679S721263; Engine # T1108IT19S721263; Le Mans Blue, Black vinyl hardtop/Black; Black vinyl top; Estimate $650,000 – $750,000; Unrestored original, 2- condition; With Reserve; Hammered Sold at $560,000 plus commission of 10.00%; Final Price $616,000 – 427/430hp L88 engine, 4-speed, power brakes, F41 suspension, Positraction, J56 brakes, transistor ignition, Rally wheels with trim rings, blackwall tires, rear window defroster, vinyl hard top. Documented with tank sticker, Protect-O-Plate, statement of origin and bill of sale. Original engine. – Sound original paint other than lots of crazing on the hood, a few big scratches on the front fenders, chips at the back of the doors, and touch ups here and there. Lightly scratched up brightwork. Very good roof vinyl. Original interior is excellent. Very tidy underneath. A Bloomington Gold Survivor. Its flaws are largely irrelevant, because this is a preserved original L88 with known history, and that is what counts. – Hammered not sold at $550,000 at Mecum Anaheim in 2012 but sold at Gooding Scottsdale in 2013 for $825,000, which was an exceptional but not unjustifiable price for such a well known and highly documented original L88. This result was below Worldwide’s reasonable low estimate and less than such a car really deserves. The L88 market seems to be in a state of flux, with an influx of examples coming to market recently and that seems to have satisfied demand except at favorable (to the buyer) prices. 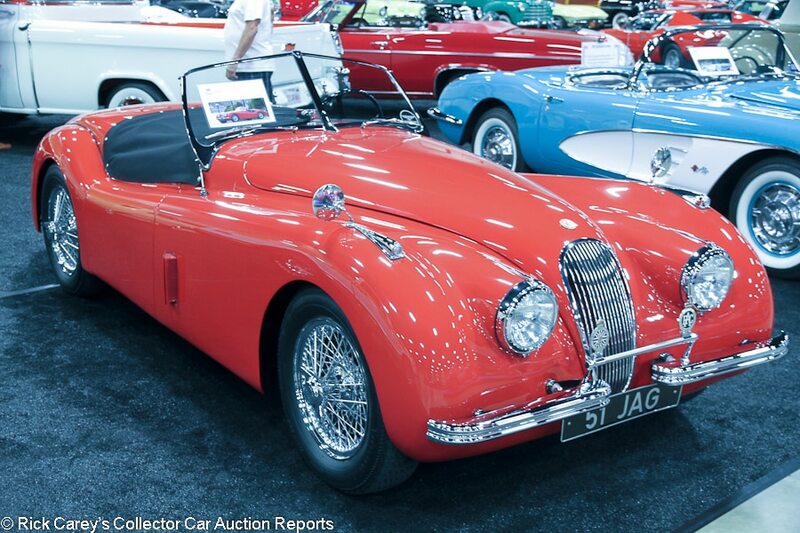 Lot # 133 1951 Jaguar XK 120 Roadster; S/N 671282; Engine # V32602; Carmen Red/Black leather; Estimate $90,000 – $110,000; Recent restoration, 2 condition; With Reserve; Hammered Sold at $72,500 plus commission of 10.00%; Final Price $79,750 – Firestone tires, chrome centerlock wire wheels, dual wing mirrors, badge bar, black cloth tonneau cover, under dash radio. – JDHT Certificate. Spotless engine bay and underbody. Very good paint and interior. Represented as numbers matching. Represented as body-off restored 100 miles ago. The stated engine number, V32602, is from an XK 150. – “Numbers matching” is a bit of a problem with an XK 150 V-prefix engine under the hood. The price, however, seemed to leave the discrepancy in limbo as this is good price for a quality restored XK 120 even with the wrong engine. Both the buyer and the new owner (taking it under no delusions) should be dissatisfied with this result. 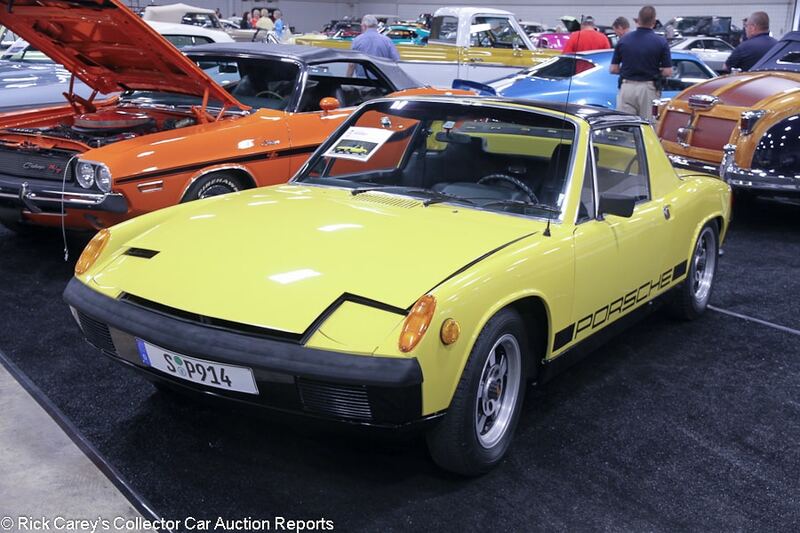 Lot # 134 1970 Porsche 914/4 Targa; S/N 4702901600; Canary Yellow, Black roof/Black leatherette; Estimate $25,000 – $35,000; Enthusiast restoration, 3 condition; With Reserve; Hammered Sold at $12,500 plus commission of 10.00%; Final Price $13,750 – 1679/85hp, fuel injection, 4-speed, Michelin XWX tires, Blaupunkt AM/FM radio. – Roof incorrectly (and poorly) painted with glossy black finish. Right windshield washer nozzle is missing. Some light orange peel on the hood and headlight doors. Crack in the right taillight. Pitted door handles. Wavy dash top and a cracked vent, but otherwise decent interior. Lightly scratched windshield. Enthusiast restored quickly and on a budget. No better than your average driver. – A 1.7-liter 914 is still a cheap way to get into Porsche ownership, and decent examples can still be found for under five figures. This car is no better than decent, however, and the result is definitely on the expensive side for a compromised car. 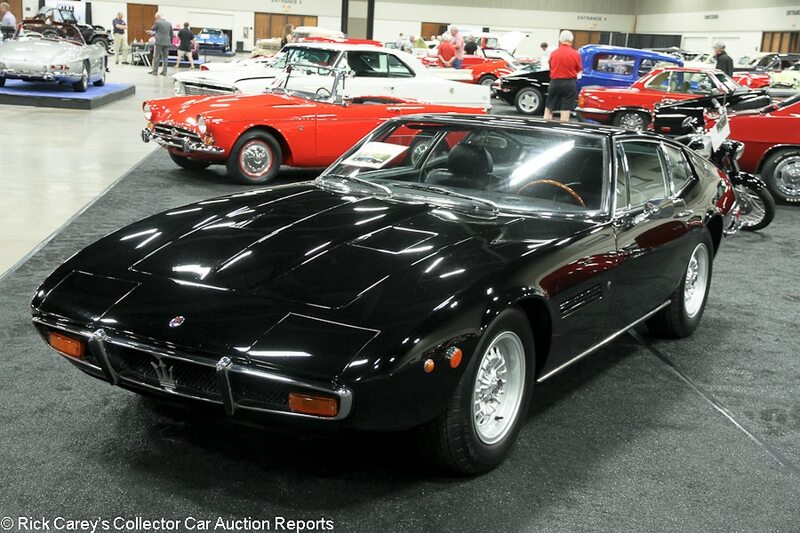 Lot # 138 1972 Maserati Ghibli SS Coupe, Body by Ghia; S/N AM115492316; Black/Black leather; Estimate $300,000 – $350,000; Visually maintained, largely original, 3+ condition; With Reserve; Not sold at Hammer bid of $270,000 – 4930/335hp, four Webers, 5-speed, Borrani alloy wheels, Cinturato tires, woodrim steering wheel, power windows, air conditioning, Blaupunkt AM/FM steering wheel. – Decent 1989 repaint with a big, deep scratch on the nose as well as light detailing scratches all over, several chips on the tail, and scratches and cracking around the filler cap. Light road wear underneath. Very well preserved original interior with lightly wrinkled seats. Lightly scratched rear glass. Represented as numbers matching. Rebuilt engine finished two years ago. Not totally original, but well cared for. – This compromised Ghibli SS might reasonably be worth a little more than the bid reported here, but is it realistic to subject it to more trips and months waiting for the right buyer to show up? It may be, but transport costs, maintenance, advertising and auction entry fees will soon turn the equation upside down. The bid here could have been taken with the result written off to experience. 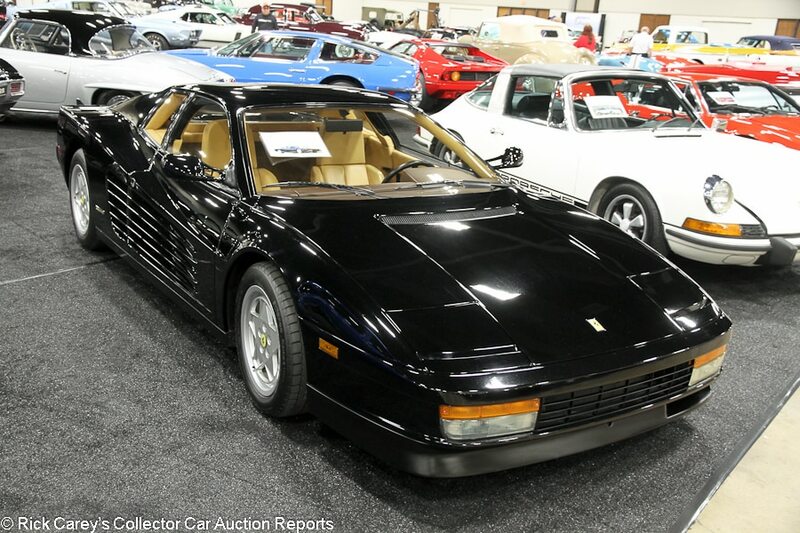 Lot # 139 1988 Ferrari Testarossa Coupe, Body by Pininfarina; S/N ZFFSG17A2J0077805; Nero/Tan leather; Estimate $110,000 – $140,000; Unrestored original, 2- condition; With Reserve; Hammered Sold at $90,000 plus commission of 10.00%; Final Price $99,000 – Power windows, air conditioning, Momo leather-wrapped steering wheel. – Lightly detail scratched and swirled original paint with a few tiny chips on the nose. Lightly but visibly worn and wrinkled seats. Driver’s seat is a bit flat. Recent engine-out service. Showing 14,829 miles. A used car. Frankly less impressive than many Testarossas out there, but still quite attractive and clearly well taken care of. – Sold at Barrett-Jackson in 2002 for $83,160 and showing 534 more miles on its odometer today than it did fifteen years ago (which were then stated as the actual from new miles) the seller gracefully accepted buyers’ judgment and took this bid on a car with no documented recent service. It would be unwise to drive it more than a few meters before an expensive service. 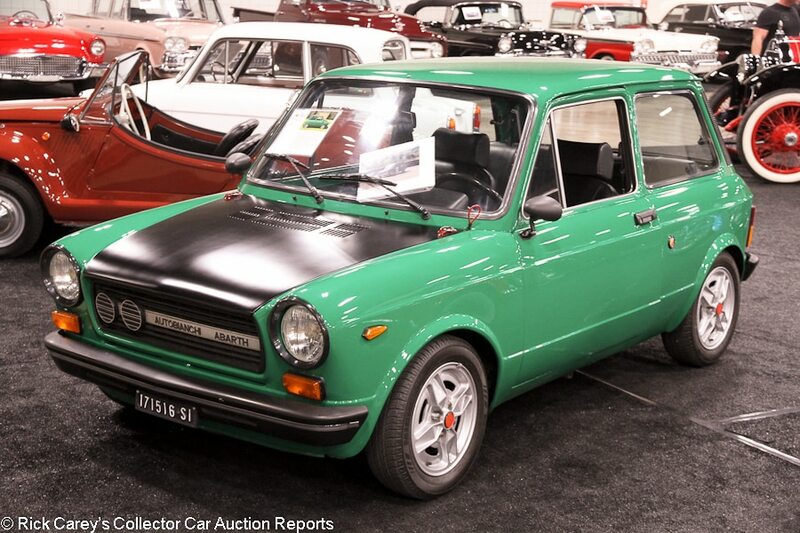 Lot # 143 1976 Autobianchi A112 Abarth Hatchback; S/N A112S1542923; Green, Black hood/Black vinyl; Estimate $25,000 – $35,000; Modified restoration, 2- condition; No Reserve; Hammered Sold at $12,000 plus commission of 10.00%; Final Price $13,200 – Cromodora wheels, Michelin tires, hood pins, Abarth steering wheel, Sparco pedals, fuel cell. – This car was used as a rally car and is now in road configuration. Very good paint. Clean wheels. Tidy underneath. Good interior. Restored to better than its competition car days and looks just about like a new car even if this isn’t exactly how it left the factory. – The A112 Abarth is essentially a somewhat less elegant Italian take on the Mini Cooper, offering a peppy front-drive powertrain in a lightweight hatchback package. You hardly see them in the U.S. and they are nowhere near as well known as the Mini, so it wasn’t too much of a surprise to see that without much of an etceterini crowd in Dallas this car flew under the radar and went for cheap. It’s a lot of fun per dollar, and a fraction of what a genuine Cooper S in this condition would bring. This result squares with A112 results in Europe where they’re familiar with the model. 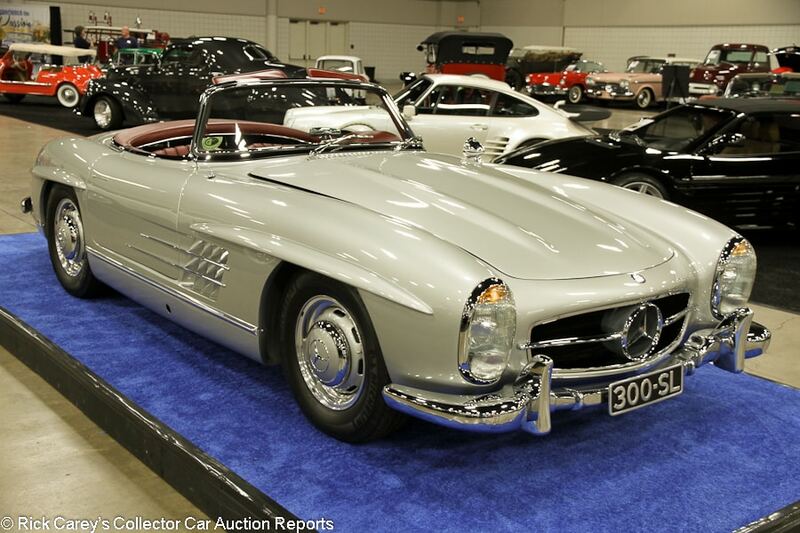 Lot # 144 1957 Mercedes-Benz 300SL Roadster; S/N 1980427500378; Engine # 1989807500392; Silver/Red leather; Red top; Estimate $1,200,000 – $1,400,000; Older restoration, 2+ condition; With Reserve; Hammered Sold at $1,010,000 plus commission of 10.00%; Final Price $1,111,000 – Michelin Harmony tires, dash clock, radio, matching luggage. 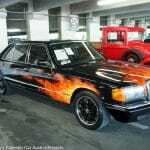 – Excellent paint, chrome and interior. Restored by Rudi & Company in Canada in 2002. Class winner at Amelia Island and Hilton Head and still showable. – With a reassuring history of four decades of single ownership and a class-winning restoration by a specialist that is holding up extremely well this is a highly satisfying 300SL Roadster that needs nothing, particularly at this price. It probably was worth a little more a few years ago, but this result is right on the money today. 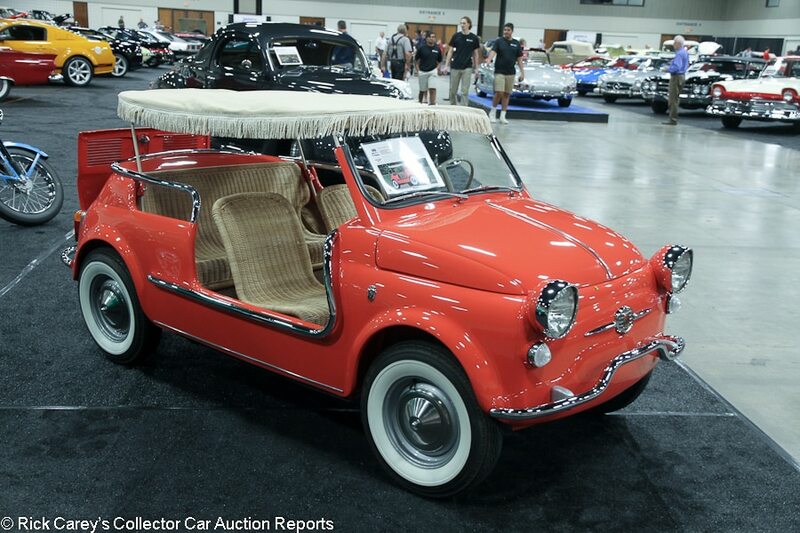 Lot # 145 1960 Fiat 500 Jolly, Body by Ghia; S/N 110158442; Coral/Wicker; White cloth top; Estimate $80,000 – $110,000; Recent restoration, 2 condition; No Reserve; Hammered Sold at $52,500 plus commission of 10.00%; Final Price $57,750 – Hub caps, whitewalls. – Very good paint and chrome. Very clean restored engine bay. Not over-restored like most Jollies seem to be, but freshly done and quite pretty. – Jolly prices are jolly: jumping around from place to place and time to time with little relationship to reason. This is in the upper-middle range and is justified by its fun factor. 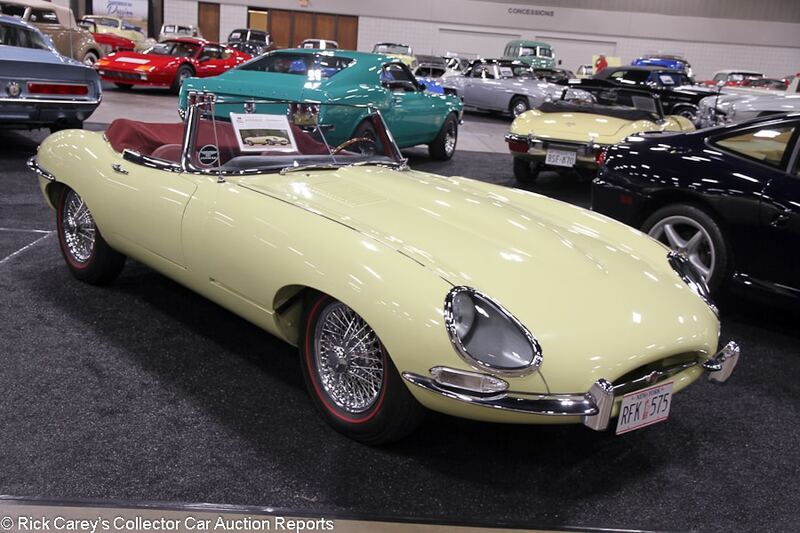 Lot # 148 1964 Jaguar XKE SI Convertible; S/N 879997; Engine # RA3247-9; Primrose/Red leather; Estimate $150,000 – $180,000; Older restoration, 2- condition; With Reserve; Hammered Sold at $135,000 plus commission of 10.00%; Final Price $148,500 – Chrome centerlock wire wheels, red line tires, red cloth boot cover, woodrim steering wheel, Blaupunkt AM/FM stereo. – Lightly scratched bumpers. Very good older paint. Headlight bezels don’t quite fit flush. Very lightly worn seats and lightly worn original switchgear. Represented as numbers matching. JDHT Certificate. Apparently used in the film The Wolf of Wall Street. An attractive older restoration that’s not a piece of jewelry. It’s a car to get in and drive, and turn some heads in the process. – There could hardly be a more appropriate car for an upcoming Wolf of Wall Street than a crumpet-catching E-type and the condition of this one is about what’s expected for a movie car, as it the price it brought. 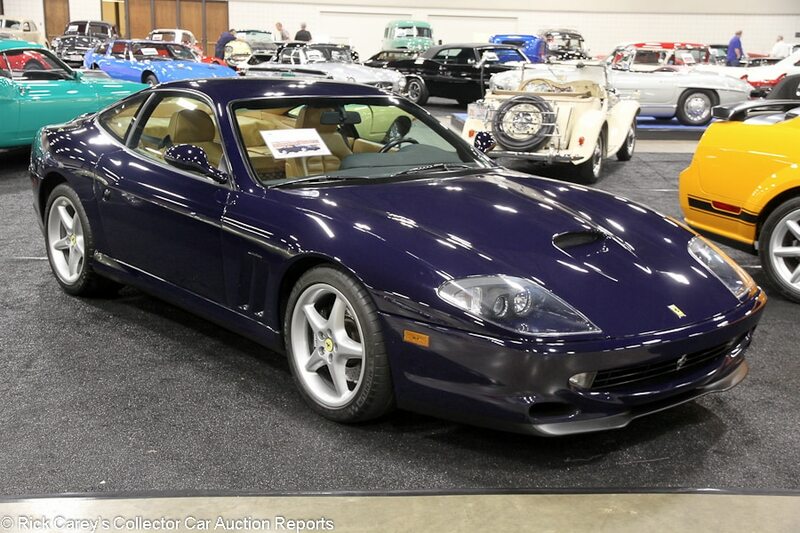 Lot # 149 1998 Ferrari 550 Maranello Coupe, Body by Pininfarina; S/N ZFFZR49A8W0110966; Blu Pozzi/Tan leather; Estimate $125,000 – $150,000; Unrestored original, 2- condition; With Reserve; Hammered Sold at $95,000 plus commission of 10.00%; Final Price $104,500 – 6-speed, Pilot Sport tires, cross-drilled rotors, power windows, air conditioning, factory cassette stereo. – Headlight lenses are a bit foggy and lightly scratched. Lots of light scratches on the filler cap. Chip at the back of the driver’s side door. Excellent interior. Paint coming off the driver’s side window frame. No word about any recent service. Finished in a rare color, but just a used car by Ferrari standards. – This is about half what this car cost new and looks at first glance to be on the cheap side for a 550 in today’s market, when really good examples are often asking over 150 grand. This one, however, isn’t “really good” and without a recent major service history will be right back up there in low six figures after it’s been to the Ferrari dealer. Lot # 151 1963 Shelby Cobra 289 Roadster ‘Dragonsnake’; S/N CSX2093; Fuchsia Metalflake, Fuchsia hardtop/Black; Estimate $1,100,000 – $1,300,000; Not viewed, notes from the catalog and prior experience; Not sold at Hammer bid of $825,000 – 289 V-8, four Webers, hardtop, chrome paperclip rollbar, wire front wheels, wide centerlock alloy rear wheels with drag slicks, long tube headers ending in short side-mounted pipes. – Good but unimpressive paint. Sound chrome, good interior. An older restoration to nearly like new condition that appears to have been static displayed since. AACA Senior winner, restored to like new condition (and better than it ever was when making dragstrip passes in the mid-11’s.) Dragged for years, a consistent winner driven by Bruce Larson when owned by Jim Costilow and later for Ed Hedrick. “The winningest competition Cobra in history.” – Sold by Mecum at Kissimmee in 2011 for $927,500, a year later at the same venue it sold for $901,000. At Mecum Houston in April 2014 it was reported bid to $1.1 million, then sold at RM’s Arizona auction in 2016 for $990,000. It is a well known and distinctive car making it difficult to put into the market with a generous reserve and expect Cobra buyers not to know its history. The bidders here attempted to take advantage of its ups and downs and both the bidders and the consignor failed to reach a mutually acceptable compromise. It would be nearly glorious to see it properly set up and prepared making passes on the quarter mile. 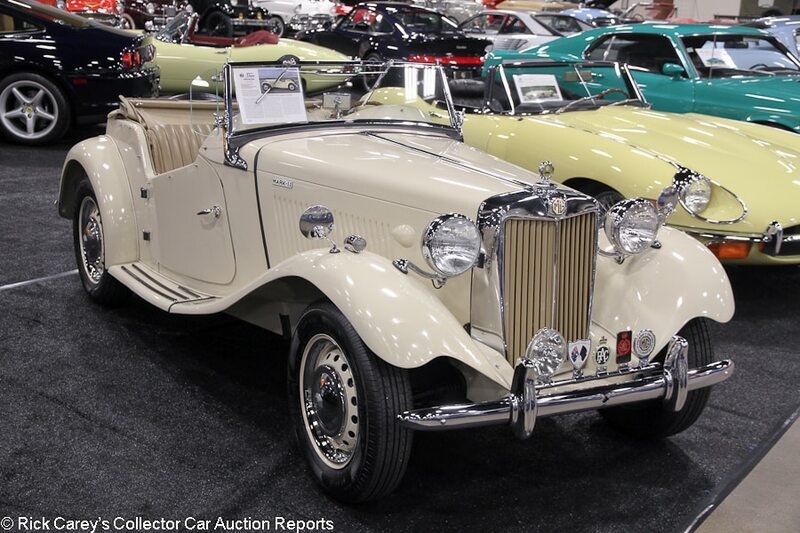 Lot # 157 1952 MG TD Roadster; S/N XPAGTD213826; Cream/Tan leather; Beige cloth top; Estimate $35,000 – $50,000; Older restoration, 3 condition; No Reserve; Hammered Sold at $21,000 plus commission of 10.00%; Final Price $23,100 – Hub caps and trim rings, Nanking tires, dual wing mirrors, Boyce Motometer, badge bar, single Lucas driving light, wind wings, banjo steering wheel, luggage rack, rear-mounted spare. – Somewhat dull older paint. Several big cracks and rub through on the hood. A few chips around the edges of the doors. Several touch ups on the doors as well. Light discoloration to the vinyl dash. Very clean underneath. One of 1,710 Competition versions of the TD, which featured a bit more power thanks to higher compression. Restored in 1969 but supposedly restored again at some point after that. In driver condition. – Not sold at Leake OKC back in February at a $20,000 high bid. The consignor read those tea leaves, put it in Worldwide’s Dallas auction without reserve and got a thousand dollars more on the hammer, about enough to pay the fees and transport cost. 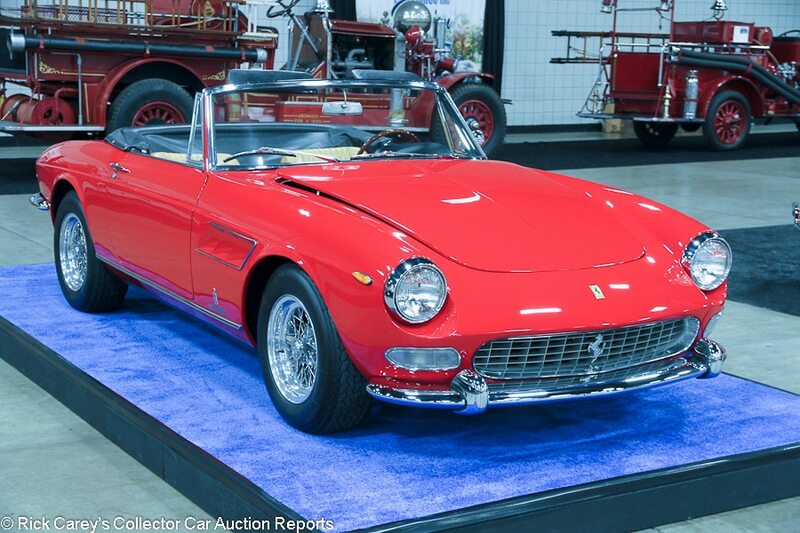 Lot # 158 1965 Ferrari 275 GTS Spider, Body by Pininfarina; S/N 07007; Red/Tan leather; Black cloth top; Estimate $1,400,000 – $1,800,000; Older restoration, 2- condition; With Reserve; Not sold at Hammer bid of $1,150,000 –Borrani wire wheels, Michelin XWX tires, Ansa exhaust, fire extinguisher, woodrim steering wheel, black leather boot cover. Comes with books and tools. – Very good older paint with a small crack below the windshield and another one on the passenger’s side door. Chip on the right rear fender. Small scratch on the driver’s door. Very good, lightly worn interior. Clean underneath. Very good chrome. Restored in Italy. Massini documented. Numbers matching. One of 200 built. Sold new in San Francisco. Restored in Italy during the 1980s. Restored again about 15 years later, and that work has held up very well apart from a few minuscule paint flaws. – Sold by RM in Arizona eight years ago in 2009 for $385,000 and showing about 300 more miles on the odometer since then. The value is going up faster than the mileage, that’s for sure. No 275 GTS has sold for under 7-figures since 2013 which makes the reported high bid here very modest even though it would have been over a million and a quarter with commission. 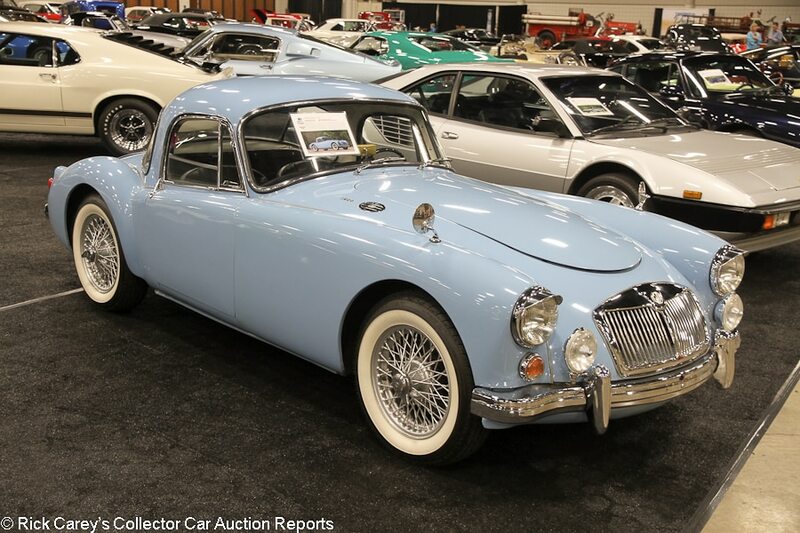 Lot # 162 1960 MG A 1600 Mk I Coupe; S/N GHDL77155; Engine # 15GAU26372; Iris Blue/Black vinyl; Estimate $35,000 – $45,000; Visually maintained, largely original, 3 condition; No Reserve; Hammered Sold at $25,000 plus commission of 10.00%; Final Price $27,500 – Painted centerlock wire wheels, whitewalls, dual wing mirrors, Lucas driving lights, banjo steering wheel, heater. 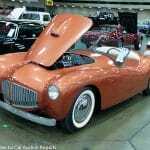 – Sound older or possibly original paint with small chips on the right front fender, a long and deep scratch on the left rear fender, chips and cracks around the trunk lid, and several chips around the edges of the driver’s door. Door gaps are uneven. Very good, mostly original interior trim other than a small rip in the carpet over the transmission tunnel. Good newer upholstery. Mostly original and remarkably well kept. – This car presents like an average driver quality A Coupe, but the bidders in Dallas recognized its impressive level of preservation and afforded it the kind of money a freshly restored example would normally bring. It may appear to be expensive on the surface, but reasonably reflects its preservation. 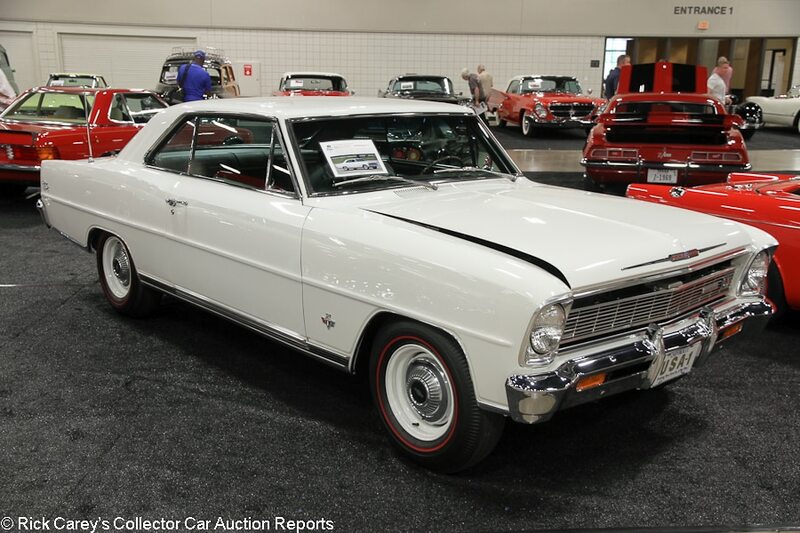 Lot # 163 1966 Chevrolet Nova SS 2-Dr. Hardtop; S/N 118376N104742; White/Black vinyl; Estimate $100,000 – $125,000; Recent restoration, 2 condition; With Reserve; Not sold at Hammer bid of $85,000 – 327/350hp L79 engine, 4-speed, 12-bolt rear end, Positraction, hub caps, Firestone red line tires, floor shift, pushbutton radio, Protect-O-Plate. – Very good paint, chrome, interior and underneath. Fully restored to very high standards in 2014. Nothing to pick on. – The reported high bid for this high quality, high performance Nova SS is no less than reasonable and could have been taken without regret. The consignor is tilting at windmills to expect any more than this. 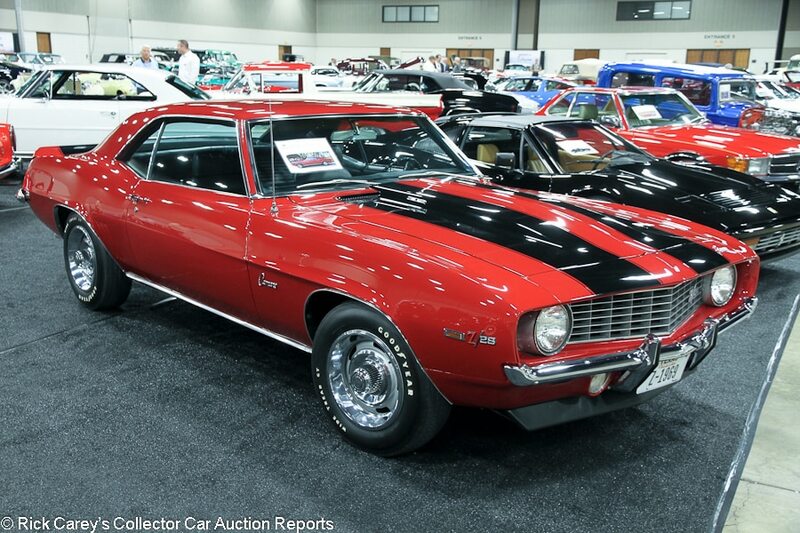 Lot # 168 1969 Chevrolet Camaro Z/28 2-Dr. Hardtop; S/N 124379N605752; Garnet Red, Black stripes/Black vinyl; Estimate $80,000 – $100,000; Recent restoration, 2 condition; With Reserve; Not sold at Hammer bid of $62,500 – 302/290hp, M20 4-speed, Rally wheels, 3.55 rear end, Goodyear Wide Tread GT tires, cowl induction hood, Hurst shifter, Delco radio. – Very clean, fresh engine bay and underbody. Very good paint and chrome. Excellent interior. Represented as matching numbers. A fresh, attractive and real Z/28. – A ’69 Z/28 is always attractive but is particularly attractive in this unusual color. It will leap out of any Camaro lineup. The consignor realistically expects more for it that this parsimonious offer.